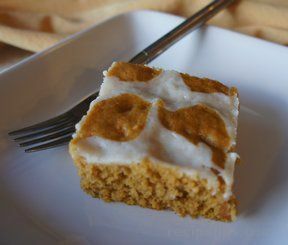 Moist and delicious bars that everyone will love. You can make these into cupcakes, too. In a small bowl, sift flour and soda. In a large bowl, beat eggs; add oil, salt, cinnamon and sugar. Pour into lightly greased jelly roll pan. Bake at 350° for 30 minutes. 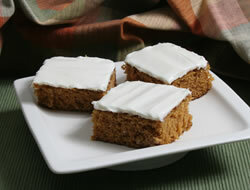 For frosting, combine ingredients for frosting and then frost cooled bars. 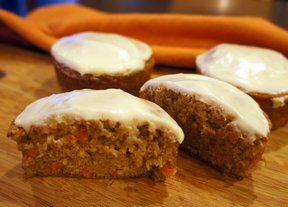 "My husband loves carrot cake so I tried these for his birthday. He loved them! 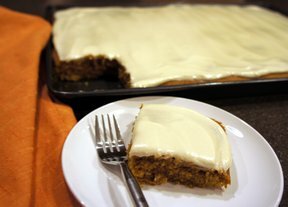 Great flavor with the cinnamon and carrots. I will be making these again."